Assess your understanding, apply what you’ve learned, and practice for success. 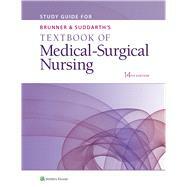 Review what you’ve learned and test your understanding of the medical-surgical concepts presented in Brunner & Suddarth's Textbook of Medical-Surgical Nursing, 14th Edition with this easy-to-use study resource. Assess your understanding with fill-in-the-blank, short answer, and matching questions for each chapter from the textbook. Apply your knowledge to case-based questions that put textbook concepts in a realistic context. Practice for the NCLEX-RN® exam with multiple-choice and alternate-format NCLEX®-style questions with corresponding answer key.